Design and Analysis of Rescue Robot Li Yi;Ma Xiangyu;Li Yuan;Xi'an Aeronautical University;Haima Automobile Co.
Research on Energy Saving Control Technology of Variable Frequency Adjustable-speed Belt Conveyor Wu Lan;Zhao Qi;Hu JiANDong;Xilingol Vocational College;Shenhua Beidian Victory Energy Co.
Study of Multiple Belt Conveyor Variable Frequency Speed Control System Based on S7-1500PLC Song Liguang;Changzhi Co. Application of Intelligent Coal Disk Equipment in Coal Storage Farm Wang Yanchun;Datang Environment Industry Group Co.
Damping Characteristics Simulation of ADS Valve of Adjustable Shock Absorber Wang Shumeng;Xie Fangwei;Zhang Bo;Anhui Mining Mechanical and Electrical Equipment Co. Numerical Simulation and Experimental Study on Screw Conveyor Based on Fluent Zheng Jun;He Haibo;Hou Haiyan;Luo Hongmei;China Railway Engineering Services Co.
Design and Research of Multifunctional Equipment for Rescue Channel Building in Coal Mine Disaster Liu Fuxin;Gong Yanchuan;Wang Zhiguo;Shijiazhuang Coal Mining Machinery Co. Discussion Feasibility Test of Summer Welding of Q550 Material Cover Beam Liu Liyun;Xinju Coal Machinery Equipment Manufacturing Co.
Study on Parametric Design and Stability of Transmission Drum of Belt Conveyor Ma Wu;Huo Mingming;Ningxia Tiandi Coal Machine Co.
Development of Drilling Gyrator Running Test Bench Liu Huan;Tian Dongzhuang;Yang Ruibo;Wang Zheng;Dong Mengmeng;China Coal Research Institute;Xi'an Research Institute Co.
Optimized Design Analysis of Prestressed Combination Structure of Shearer Hydraulic Rod Zhang He;Baizhuang Coal Mine Co. 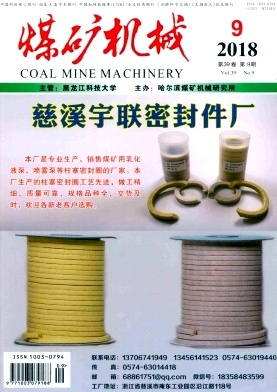 Improvement of Bolt Protection Measures for Compound Mining Equipment in Coal Mine Deng Yuhua;Datong Coal Group Co. Improvement and Application of Spray System for MG300/700-WD Electric Haulage Shearer Zhang Xiaogen;Ordos City Yingpan Trench Coal Co. Thick Coal Seam Fully-mechanized Caving Small Coal Pillar Mining Equipment Modification and Production Process Wang Shubo;Mining Products Safety Approval and Certification Center Co.
Key Technology Research and Application of Large Mining High Angle Hydraulic Support Chen Fei;Li Liang;Jiahua Machinery Co. Method of Cutting Control for Roadheader Sun Yanfei;Wang Ying;Ma Ziyun;China Railway Engineering Equipment Group Co. Fault Identification of Variable Speed Gearbox Based on Wavelet Transform Wu Jian;Ke Zhenxing;Li Ning;Jiang Tao;Huang Weiguo;Suzhou CAERI Automotive Test Research Co.